This is the first in a series of biographical sketches that I have planned. My goal is to map out my extended Thornton Family and their descendants and their roles during the American War of Independence. Here is what I know about Colonel Samuel Clyde. Samuel was born in Windham, New Hampshire on 11 April 1732. His father, Daniel, was a Scots-Irish immigrant from the Londonderry area of Ireland. He immigrated about 1732 and settled near Londonderry, New Hampshire. His mother, Ester Rankin, was also Scots-Irish. Daniel died in Windham, NH in 1753, about the time that Samuel is believed to have left New Hampshire for New York. Samuel is reported as having been a member of the New Hampshire militia. He built docks and a type of boat known as a batteau in Halifax and participated in the attempt to take Ft. Ticonderoga and the battle of Ft. Fontenac in 1758. It was there that he first met Matthew Thornton, the company doctor, and uncle of his future wife. Samuel settled in the Mohawk Valley of New York. The area had been first settled by Palatinate Germans in the 1600's. Many of these 'Dutch' people left New York for Pennsylvania and became part of the Pennsylvania Dutch. Their New York lands were taken up by many Scots-Irish families as well as English colonists. This area was also the home of the Six Nations; six Iroquois tribes. Samuel is known to have been in New York in 1758 when he was appointed Captain in a company of Rangers. The Ranger groups were formed in the wake of the French and Indian Wars that ravaged the frontier. 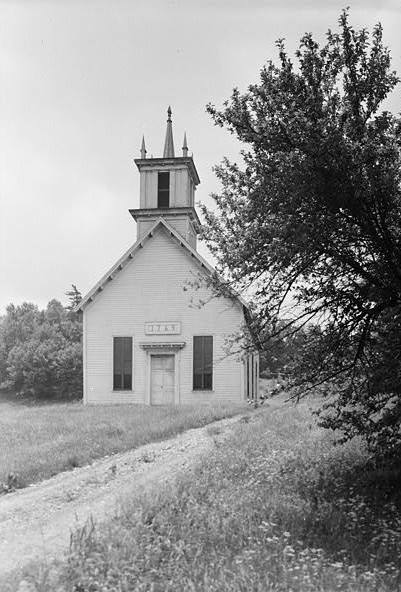 Samuel put his carpentry skills to good work, building a chapel for the Mohawks, on land donated by Joseph Brandt in 1769. In 1761 he married Catherine Wason, daughter of Agnes Thornton and John Wason. Agnes was the sister of Matthew Thornton of New Hampshire. He would later sign the declaration of Independence. Her family left Ireland in about 1720 and wandered around Maine and Massachusetts before settling in New Hampshire. Together with her brother William, his wife Dorcas Little, their children and the family of Dorcas' father Thomas Little, they made the trip to Schenectady, New York. 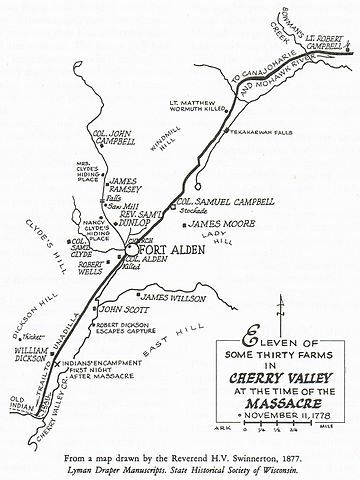 In 1762 Samuel and Dorcas moved west to Cherry Valley. Their family grew rapidly as they did in those days. Their children were Agnes, Ann, Jennie, Catherine, Matthew, George, Joseph, and Esther. 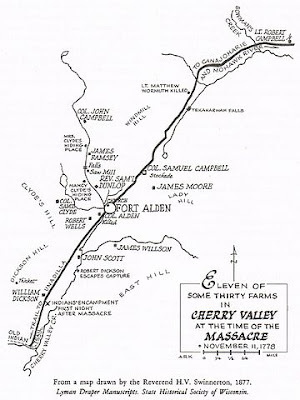 In 1768 Samuel purchased a farm about one mile from the center of Cherry Valley. On 27 August 1774 a Committee of Correspondence was formed in Tryon County. These committees were popping up all over the colonies as tension mounted between England and her unruly subjects. The Battle of Lexington and Corcord was fought on April 19, 1775. The following month, a Committee of Safety, of which Samuel was a member, meet at the Cherry Valley church and drew up Articles of Association. The articles were put to all men in the County, if you signed you were a patriot if you refused you were a loyalist, also known as a Tory. Samuel was a member of the Committee and clearly a Patriot. The Superintendent of Indian Affairs for the British Government, Guy Johnson fled to Canada. With his was Thayendanegea, aka Joseph Brant and the Butler brothers, loyalist and Tories all. Tory properties were confiscated, eventually sold to raise funds. In August 1777, the Tryon County Militia led by General Herkimer was ambushed near the Oneida Indian village of Oriska. Major Samuel Clyde was present and fought in what is known as the Battle of Oriskany. General Herkimer died as a result of wounds he received during the battle and Samuel Clyde assumed command of the militia. On November 11, 1778 a combined force of Native Americans and Tories led by Joseph Brandt and the Butlers wreaked death and destruction on Cherry Valley. 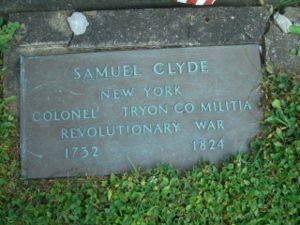 Samuel Clyde, now Colonel, was at Ft. Alden when the attack began. Catherine and the children, escaped into the nearby woods and sent the night huddled next to a log. The following morning Col. Clyde and a group of volunteers set out to search for his family. They were found and escorted under fire into the fort. There they found the bodies of many of their friends and neighbors, murdered and scalped by the enemy. The Clydes left their Cherry Valley home for the duration of the war. They lived with their Thornton relatives near Schenectady in Curry's Bush, today's Princetown. Samuel and his family returned to Cherry Valley after the war to rebuild their lives. Samuel was chosen Sheriff of what became Montgomery County. Samuel died in 1790 but Catherine lived until 1824. They were buried in Cherry Valley. 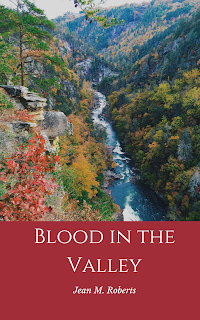 If you're interested in reading a historically accurate account of the life of Samuel and Catherine Wasson Clyde, check out my book, BLOOD IN THE VALLEY. It is available on Amazon in both Kindle and paperback formats. If you have Kindle Unlimited it's free!